Set against the framework of a crowd-funded initiative by Vibhavana to support an ailing artist, Rasoham offered a varied fare to the rasikas.The spearhead of this event was Indu Santosh, nurturing the legacy of the legendary Dhananjayans through her Guru Shobana Balachandra. Her students Isha Balakrishna, Manaswini Rajagopalan, Sanjana Varma, Hemashree R,Tushara G and Shreya Srinivasan began with a Jatiswaram in Ragamalika following it with a Ganesha Shabdam which recapitulated the glorious choreography of the Dhananjayans.Delightfully executed with captivating expressions, it set a buoyant mood to the proceedings of the day. In contrast was the display of body conditioning through the art of Kalaripayattu by the students of Ranjan Mullarat.The students Meera Ravikrishna, Chetna Veeramalla,Thea Shekaran, Upasana Gurjer and Shreeprada Bhavagna Araveti showcased their skills,beginning with the traditional salutation followed by a sinuous display of advanced body exercises and use of stick and metallic weapons. The opening feature program was Mohiniattam by the talented Malavika Menon. She stepped on to the stage with a costume which bespoke of the aesthetics. The costume change adopted has been designed by her Guru Vinitha Nedungadi in 2010 inspired from the traditional Kerala Kalaripayattu style pyjama. Such a model was worn by Kerala women in the past in a combination called "Thattu" and "Rowka." 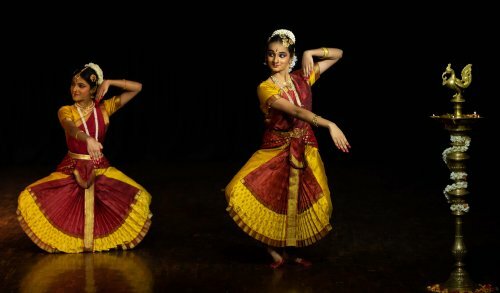 The costume provided the freedom of exploring movements further through the medium of Mohiniattam without having a restriction or constraint on using the lower body to communicate. A fine blend of aesthetics and lucid abhinaya caught the eye of the art lovers as she portrayed "Ananda Narthana Ganapathy" in Kedaram. 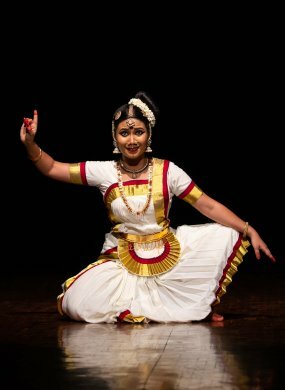 In the pure nritta piece that followed "Mukhajaalam", a composition of Kavalam Narayana Panicker in Ragamalika, the dancer displayed her skill in steps and movements corresponding to the chollus. The artist set the tone and tenor using the vocabulary of the dance form, devoid of angular movements, the sway and tilt communicating through delicate movements and responding sensitively to the melodious combination of the music ensemble. 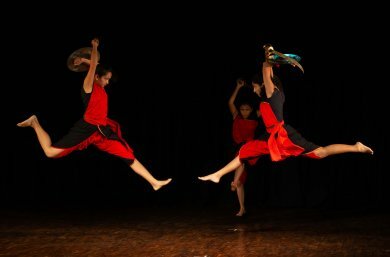 The central piece, a Mohiniattam adaptation of the famous Malayalam poem "Poothapatu"was engrossing. It describes the folklore story of a demon who lures men to her lair, puts them to sleep and kills them after sucking their blood and breaking their bones. In her midst comes Unni, a young boy who is on his way to school. Fascinated by his presence, the demon transforms herself into a young girl and plays with the boy.The boy's mother Nanneri arrives on the scene in search of her son. The demon noticing the mother's arrival tries to divert and distract her attention through the use of fire and a metal axe, puts the boy to sleep on a bed of flowers. Nanneri pleads with the demon to return her son to no avail. Finally,the mother pulls out her eyes and offers it to the demon. Shocked at this, the demon through the use of witchcraft sends a fake son to the mother. The mother realizes she has been cheated and wreaks her wrath on the demon.The demon aware of the consequences of the curse decides to return Unni to his mother along with her eyes. The interpretation of the narrative through the choreography of Vinitha Nedungadi touched upon key dramatic moments with fluent hand gestures and the fluidity of a style that combined grace, refined elegance and well articulated expressions translating the narrative visually through a gamut of emotions of the characters portrayed leaving a lasting impression. The musical precision of Kottakal Madhu on the vocals accompanied by Suresh Ambadi on the violin, Rajesh Kallekulangara on the flute and P.Unnikrishnan on the mridangam expressed their skills in transforming the musical compositions into a worthy tangible experience. Her final piece "Karukarekarmukil"a composition of Kavalam Narayana Panicker was full of delightful visual frames about a peacock dancing to herald the season and the beauty of rain. A seamless flow of nritta intertwined with abhinaya explored the poetic splendour of the composition and she concluded with a shloka from Soundaryalahiri to end a long and intense performance. The final feature of the day was the scintillating Bharatanatyam performance by Vaibhav Arekar. A consummate artist with an extraordinary template of artistry that includes his skills in theatre set his theme for presentation as Nirguna and Saguna - from the formless to the form. His opening sequence, an Allarippu was engaging and evocative and the concluding Abhang encapsulated in the delivery like a beautiful essay. The Karaharapriya varnam, a Dhandayudhapani composition was marvellously revealing in its exposition. The heroine is smitten by the love for her Lord Shiva. She tells the Sakhi how the arrows of Cupid are tormenting her and it is time for her to go and fetch her lord before things go out of control. Do not delay in bringing him. 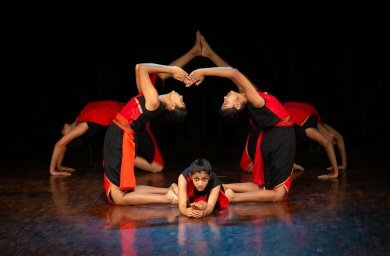 The portrayal was characterised by the unique and distinctive choreography, magnificent in its sweep as the stage space came to life with powerful nritta and refreshing abhinaya which conferred inspiring grace and dignity to the narrative that charmed the rasikas. Breathing life into the composition "Krishna Nee Begane Baro" with an embodiment of grace and serenity, the articulation transported the rasikas to another realm with the lovable and innocent Krishna where tenderness seemed to be the very essence of expression.The seamless role transformation, fluency and balance were exceptional. The concluding Thillana was vibrant with a distinctive signature of expansive dramatic movements covering the stage space. The aural landscape with Karthik Hebbar on the vocals, Kalishwaran Pillai on the nattuvangam, Satish Krishnamurthy on the mridangam and Karthik Sattavalli on the flute was intensely forceful providing a guiding framework for movement and music to be in perfect harmony.